The apartment is in the countryside of the farm, bright and furnished with period furniture, air conditioning, heating, wireless. It consists of lounge with TV, dining room, kitchen with balcony, double bedroom and bathroom. The sofas in the room are comfortable beds and can sleep a third and a fourth person. It 'also available another apartment, the mirror image of this, and that you can rent if you are possibly more people. The car can be parked in the driveway. They are available to guests newest bicycles, which reach the sea in a few minutes on the bike path. A place suitable for a family who like to relax in the silence of the green, in a special place just a few steps from the sea. A place to spend lazy days, reading, from which to bike tours of varying difficulty or to walk around in the sounds, colors and smells of the Maremma. But also a good location for a thousand other destinations in a short time and to be able to grow all your hobbies. Private garden with table, chairs and deck chairs. The grounds of the estate, also crossed by drainage canals, are planted with wheat and meadows made available to a small herd of fine Arab horses, so that you maintain an environment that attracts many birds such as mallards, Gallinelle, Doves, Hoopoe, Herons, Egrets, Falchetti, buzzards and many others. The distance from the beach of Marina di Grosseto is only 2 km. You can reach it through the cycle path immersed in the coastal pine forest and scents of underbrush, where they grow rosemary, heather, broom, juniper and many other Mediterranean plants. The beach of Marina di Grosseto is a stretch of fine sand and brown that stretches for miles. The coast is wide, wet from the clean waters of the Tyrrhenian Sea, where you can find all the amenities for a relaxing holiday. Long stretches of beach are designed with the resorts that provide all the facilities for a comfortable and safe bathing and alternate with stretches of beach. There is also a beach dedicated to 4-legged friends. Services: ample parking fee, bike path, small refreshment kiosks, Private Beach, hire sunbeds and umbrellas. 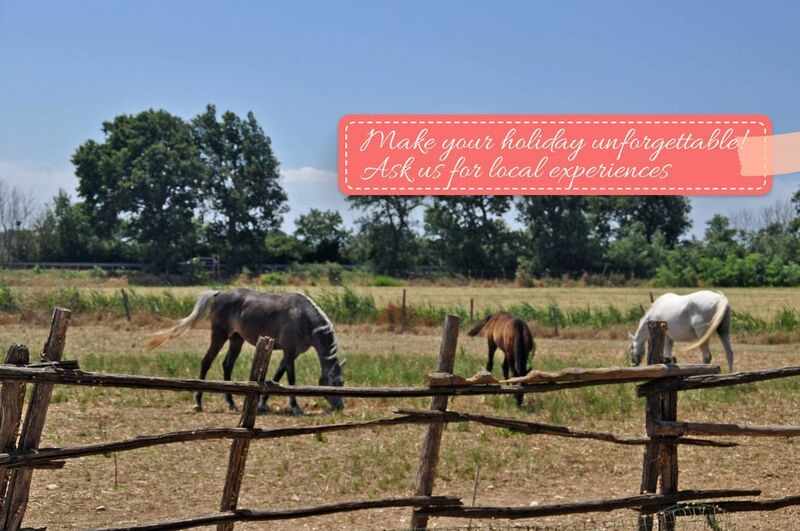 In Marina di Grosseto you can find pharmacy, drugstore, herbal medicine, a supermarket, post office, an entertainment center for children, a spa, a riding horse, the port, churches and any other service. You can also find a sailing school, windsurfing and kite surfing. The three bike paths that go towards Grosseto, Principina and Castiglione della Pescaia, will allow you to enjoy beautiful nature walks; many are also trails for mountain biking. The distance from the sea of ​​Castiglione is just 13 km. This village is an ancient village overlooking the sea, home to a marina that offers daily excursions to the islands of the Tuscan Archipelago. At about 30km you will find the beach and the prestigious port of Punta Ala Yacht Club with its cradle of the famous Luna Rossa. Sailing regattas and equipped marina are always the main attractions, along with a coastline and a sea of ​​dreams, fun day and evening, possibility to enjoy all water sports in organized structures, but also a wonderful golf club, with 18 holes immersed in the Mediterranean. Just 11 km you can visit Grosseto, with its ancient and imposing Medici walls Grosseto, among the few walkable Italy. In the center, in addition to historical monuments, the archaeological museum and the natural museum, you can find shops, local restaurants and local nightlife ..
At about 25 km you can visit the Natural Park of Maremma, which stretches between the hills of Mediterranean sea, you can see many species of animals and make beautiful walks immersed in the sounds and scents of Maremma. At about 26 km you can visit the Etruscan necropolis of Vetulonia and the Archaeological Museum where every year, in addition to the permanent exhibition is organized a temporary exhibition of Etruscan from the most famous museums and conferences with leading scholars on the subject. You can also actively participate in the new digs along with professional archaeologists through the initiative 'archaeologist for a day'. At about 70km you can visit Saturnia. Saturnia is known mainly for its impressive spa. From underground springs of Saturnia fact sulphurous water hot (37.5 ° C.) with which you make bathrooms especially nice and healthy all year. Saturnia is also known for the landscape and nature of the Maremma, the small, ancient village of Etruscan origin, the numerous archaeological sites, traditional cuisine much appreciated, and the golf course (18 holes) par 72, that make this place to say unglamorous. The distance from the railway station of Grosseto is 13 km from Pisa airport 166 km, about 92 km from Siena, Florence 159 km, 195 km from Rome. From the price excludes the cost for electricity (0.40 € per kilowatt). Es war schön ruhig uns ländlich. Die Vermieter sind ausgesprochen nett und hilfsbereit, Sie haben sich stehst erkundigt ob es uns gut geht und wir alles haben was wir brauchen. Das Haus ist schön "toskanisch" eingerichtet. Wir haben uns sehr wohl gefüllt. Was dort allerdings fehlt ist eine richtige Filterkaffemaschine die wir hier in Deutschland auch benutzen. Aber es war auch so OK. Wir werden wieder kommen.